I am about to reveal the easiest, most effective, and fastest way to get awesome new affiliates. When I share it, it will seem obvious…and yet, almost no one does it. This is part two of a 3-part series on recruiting affiliates “cold.” Read Part One: 3 Keys to Recruiting Affiliates You Don’t Know and Part Two: How to Recruit New Affiliates You Don’t Even Know Using Google. But here is the crazy thing about this…almost no one does it. I’ve been a part of more than 250 affiliate programs and product launches in my life and less than 10 of them have ever asked me to refer other affiliates. That is ridiculous! 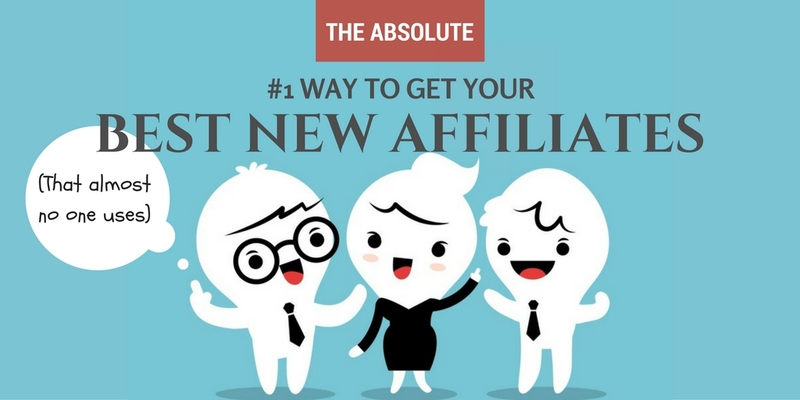 Your current affiliates should be your number one source of new, quality affiliates. So, what is the secret to asking your affiliates to refer other people? There is no secret. It’s simply a matter of doing it. Yes, I will share some of my best email templates below, but the most important thing you can do is to commit to regularly asking. Don’t be annoying, but don’t fail to capitalize on this opportunity either. Get all of our best affiliate referral templates 100% FREE here. I share more about what to do with them below, but make sure you get these templates. When Should I Ask for Referrals? I recommend making a “clear ask” every six months or so. That is often enough to be effective without being obnoxious. A “clear ask” is an email or other communication whose sole purpose is to ask for referrals. You can also include “soft asks” regularly throughout the year. A soft ask is a short request as a part of another communication. I include examples of both below. Right after a launch. The proverbial iron is hot, so strike. Ask your affiliates a week or so after your launch for referrals for the next one. Right after you’ve paid them. Right after you send payments, send another email encouraging them to refer someone. 30-60 days before a launch. If you follow our plan to warm up your affiliates, they’ll be excited prior to your launch. A month or two before the launch is a great time to ask for referrals. A PS in an email. A simple PS in a warm up email or other communication will usually get you a few referrals. Payment email. Most people don’t read them, but it’s an easy way to make a soft ask. The “links” section of your affiliate center. Make sure to include a link to referral affiliates in their links section. It’s a subtle way of asking. If you need help creating a good affiliate center, click here. In videos. If you are recording a video for your affiliates, include a quick ask. Thank others publicly. If you have an affiliate Facebook group (and you should), thank people for referrals. It’s a subtle reminder to others that they should refer someone. You could also make the 2nd tier commission a straight commission (i.e. 5-10% of gross revenue) or a flat amount per sale. 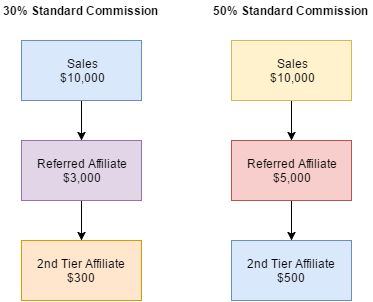 In most affiliate systems, setting up a 2nd tier link is easy. And you can also manually assign a 2nd tier affiliate to someone if they refer them via email. SUBJECT : Know anyone for Tribe Writers? We’re 47 days away from the start of the Tribe Writers launch. You ready? If you know anyone who’d be a good fit to promote the launch, let me know. Of course, we’ll hook you up with a nice 2nd tier commission. You’ll make about $31 for every sale they make. Just shoot me an email intro. and we’ll take it from there. NOTE: You can get all of our best affiliate referral templates 100% FREE here. We’ve got sample emails for right after a launch, right after someone signs up, when you pay them, and email PS notes. Click here to get all of our best templates 100% FREE. This works if you have thousands of affiliates or even just a few. It’s by far the easiest, fastest, and most effective way to expand your affiliate program. Make sure you are asking your affiliates to refer others. 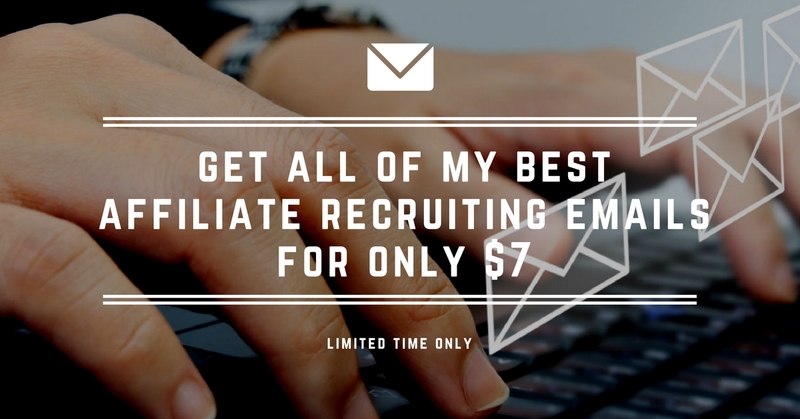 And if you are looking for more affiliate recruiting templates, click here.